Having the right plugs when travelling to Thailand is important, especially the voltage compatibility. Using the wrong plugs or voltage might end up frying your electronic devices. This guide outlines important information about power outlets in Thailand and what adapter you need to use. Our guide on “local things to do in Bangkok” will help you pack the right travel necessities for your trip. If you are from Australia, New Zealand, South Africa, Argentina or parts of China. A typical Thailand power outlet includes 2 slots with a grounding hole. Thailand voltage is 220 Volts at 50Hz. But what does it mean? You might need a voltage adapter for Thailand. Although your plugs can fit in most power outlets in Thailand, it is unlikely that the voltage is compatible with Thai electricity supply. Thailand voltage is 220 Volts at 50Hz while American voltage is 120 Volts at 60Hz. However, that being said, the majority of electronic devices nowadays are dual voltage (except some special items such as hair dryers and hair curlers). Make sure to check if your devices are dual voltage ( check on the back of your devices if they say something like 100-240V), if that is the case, you do not need a transformer. However, if your device is 110 Volts and you plug it in a 220 Volts Thai outlet, you will fry it. In this case, you need a voltage adapter to make your devices usable in Thailand. Ensure to buy the transformer with higher Wattage than your devices. For instance, if your device is 600W, you need a 1200W converter. Here is a typical voltage converter sold on Amazon. You need a power adapter. 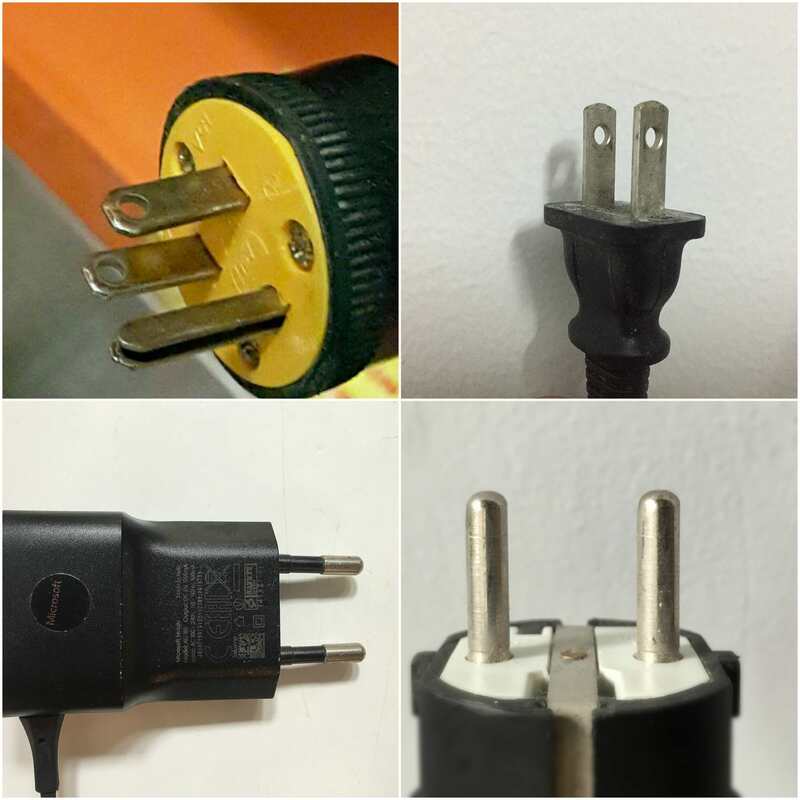 Although type G plugs (British) with 3 rectangular pins can be used in some places, they are less common and in most cases require an adapter. In terms of voltage and frequency, most British devices are 220-240Volts which are similar to the ones used in Thailand. So all you need to do is to get the right adapter. Lucky! You likely don’t need to be worried at all. Your power plugs are similar to the ones used in Thailand. European two rounded pins can fit in most of the electrical outlets in Thailand. You don’t also need a voltage converter because most countries in Europe operate at 220-240 Volts, similar to Thailand. However, to be cautious, check your devices before usage. You need a Thai power adapter. 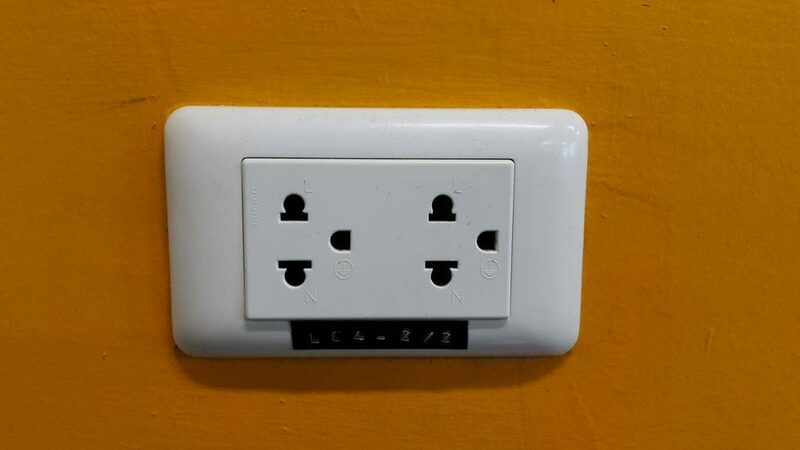 The plugs with V-shape pins will not fit in Thai outlets. Since your devices voltages are similar to those in Thailand, you only need to worry about the plug adapter. Notice: If your power plug only has 2 pins (doesn’t require a grounding hole), it still can be used if you force the head hard enough into the electrical outlets. The V shape pins seem to fit in Thailand electrical outlets if you push it in with extra efforts. However, you should only do this as a last resort, forcing the plug can result in damaging it and causing a safety hazard. It is important that you check your device voltage. Although your plugs can fit in the outlets in Thailand, the voltage might not be compatible. Japan and majority of the countries in central America use 110Volts while Thailand has 240 Volts. If you plug a device operated at 100Volts to a 240 volts ply, you will fry it. Some of the items that use 110 volts are hair dryers and hair curlers. Convenient stores: The first place you can turn to look for a travel adapter is convenient stores such as Circle K or Family Mart. They often sell universal adapters so you can actually use them in other countries too. Ask your hotel concierge. Most hotels have extra travel adapters for their guests so don’t be shy to ask them for one. If you stay at a hostel, another good idea is to ask fellow travellers if they can lend you one. Most people don’t use the adapters all day so there are plenty of opportunities for you to share one with them. Buy from electronics stores. Thailand is a heaven for shopping, especially electronic devices, so you can easily find one in those electronic malls such as Pantip Plaza in Bangkok.